I have a problem in my sewing room, I have several FQ bundles of beautiful fabric just waiting for me to find the perfect pattern for them. And I also have several great patterns that I'm eager to make, but not the perfect fabric for those! I've finally decided to stop waiting for perfect and just go for good enough. I've had a bundle of Weekends by Erin McMorris for Free Spirit setting on my shelf for over a year now. I love the prints and the colors, and not only does it have a weekend feel to it, it has a summer weekend feel to it. I decided that fabric was going to be my next project and went on search for a suitable (no longer perfect) pattern. I was looking for a pattern that had a summer and fun feel to it, and I wanted some pieces that were at least 2 1/2 inches wide so the adorable bicycle print fabric would look its best. 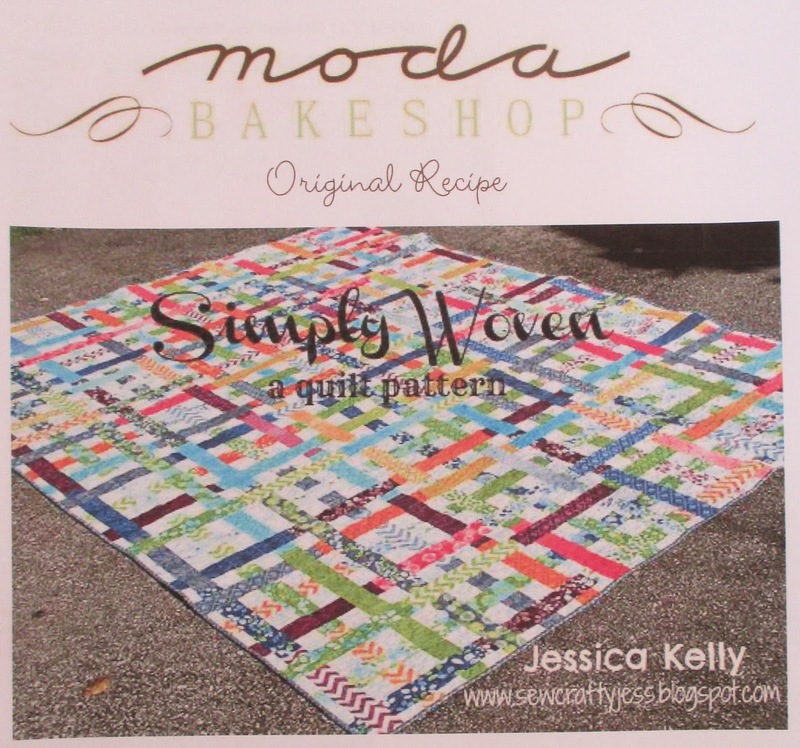 Do you ever check the Moda Bakeshop for free patterns? 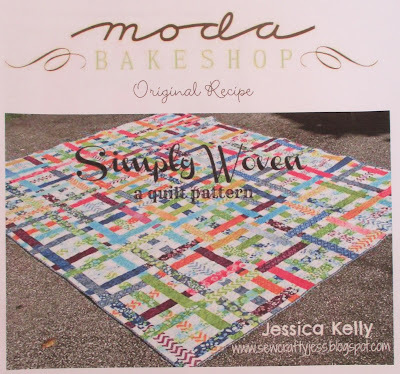 My Countdown to Christmas Quilt is one of my favorites and it's a Moda Bakeshop pattern called Starry Eyed. I keep a Bakeshop link in my Favorites list, it's always at the bottom because for some reason it doesn't update when a new pattern is posted, which is several times a week. So I check it all the time. There's some great inspiration on that site. And that's where I saw this pattern, Simply Woven by Jessica Kelly. This pattern was posted in October of 2012, an oldie but goodie! So I got his far and decided that breaking up all those stripes would maybe be fun. And as luck would have it I had just gotten Heather Peterson's Angles With Ease 2 book and those petal blocks on the cover popped into my head. You can make the blocks various sizes and with or without the center circles. I made my blocks 12 inches, the same size as my woven blocks, and without the center circle. I was so tempted to go with just one block, that one little surprise in that top, but they were so fun to make I ended up making 6, but went with 5. Cathy at Quilting on Main Street named the quilt for me, she said it looked like ribbons and bows! It has approximately 388 pieces. I think this quilt turned out better than "good enough". I also like this fabric so much better in a quilt than on my shelf. Now on to the next bundle! I love what you did with this pattern!! Great idea!! That turned out great! Love the summer feel. I have the same problem with buying fabric then hesitate to use it because the perfect pattern hasn't come along. Or I buy the fabric with something in mind, then can't remember what it was! Also just bought the Angles with Ease book. Love the cover quilt and the Christmas tree one. Did you buy the specialty ruler? I'm hoping I can use one I have. I need to make a test block. Thanks. I think it is way beyond Good Enough! Love this! It's a beautiful combination. I love how you make quilts your own. You are an Inspiration! Well that's just sooo much fun!!!!. What a great looking quilt, Thelma!! I love how you "tweak" patterns. 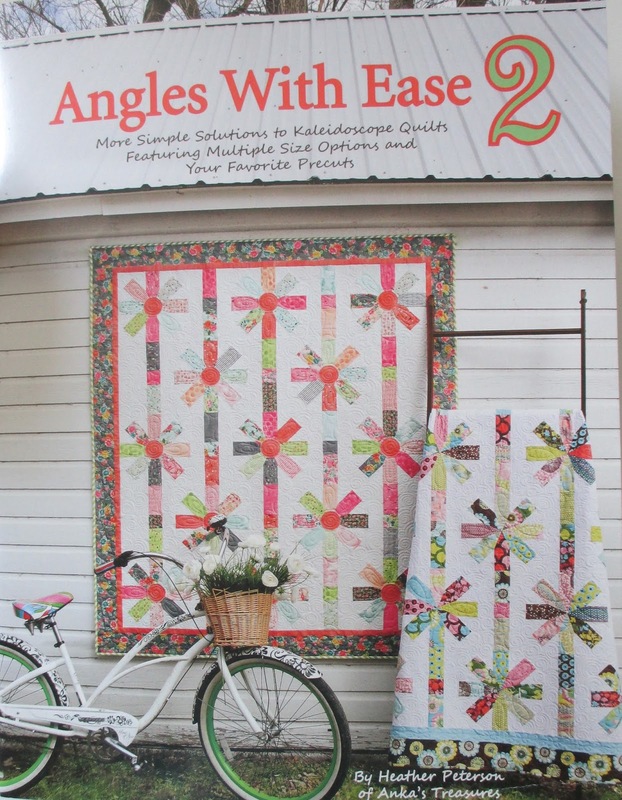 Thanks for the introduction to the Angles with Ease 2 pattern. My sewing room also has a fabric selection waiting for the "right" pattern. 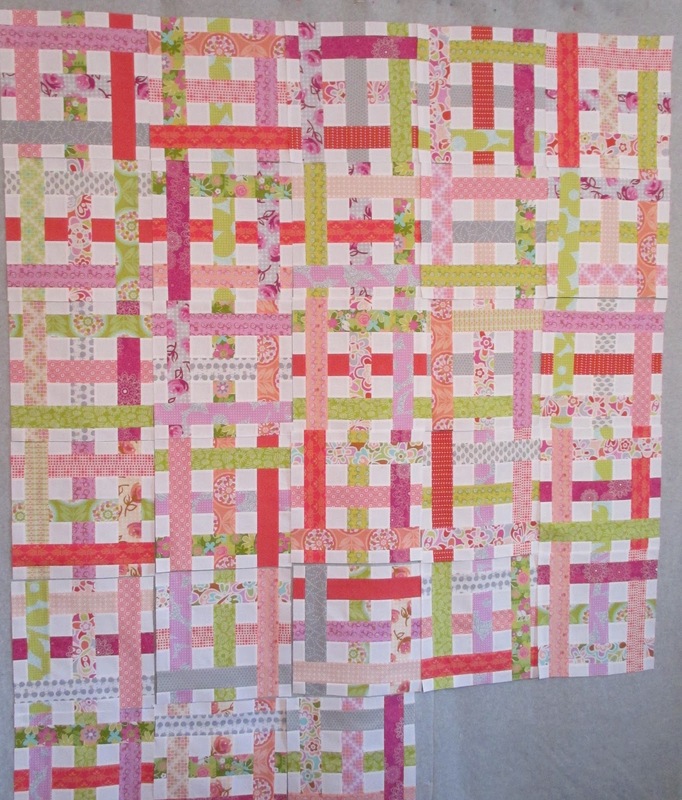 I love this quilt and it's bright summery colors. You "Thelma-ized" this pattern to perfection and it has wonderful movement to the pattern. Love this quilt! The summer fabrics are just right and the idea to add another pattern to the original one is just ... yes, perfect! This quilt is more then good enough it is PERFECT ! Don't you just love it when a plan (?!) comes together! I love how this quilt came to life! 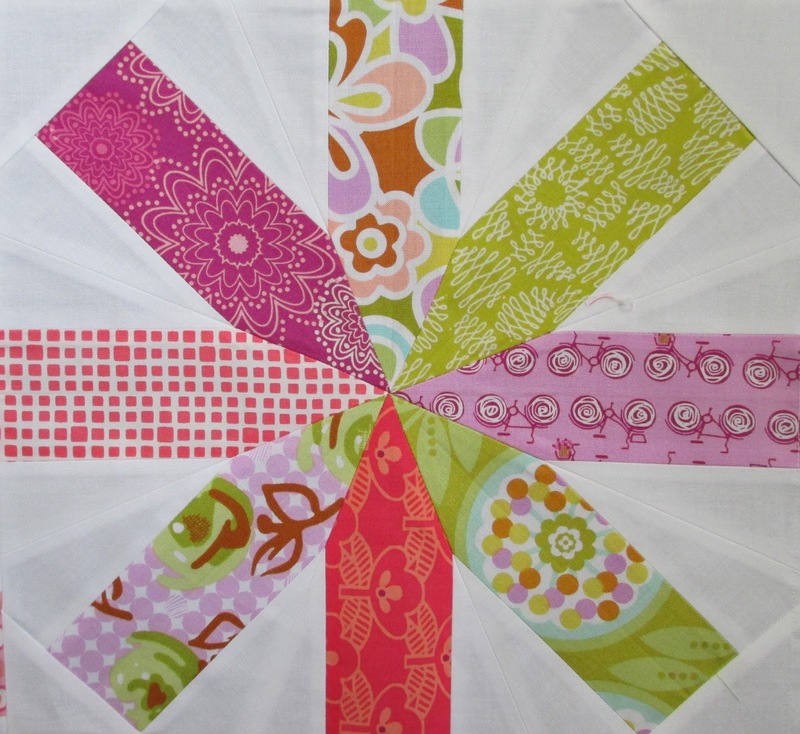 Perfect summer quilt... in a Thelma kind of way! Love it! I have this pattern on my to do list and really like your added twist. Love your quilt and the colors!!! Makes me smile. Such a good role model! I have more than a couple of bundles waiting for the perfect pattern. I think your approach is much better! 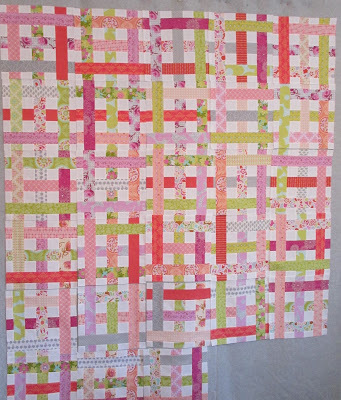 This quilt is so cute and I love Heather's new patterns too. Wow! I love this Thelma. The colors certainly say summer. You've got a wonderful mix of fabrics and patterns. It really looks better than good enough. I ought to learn from you ! Forget good enough it's perfect. I love the combination of the two patterns. That was brilliant. Your quilt surpasses either original. What a beautiful combination! Love how you did this, it is wonderful! 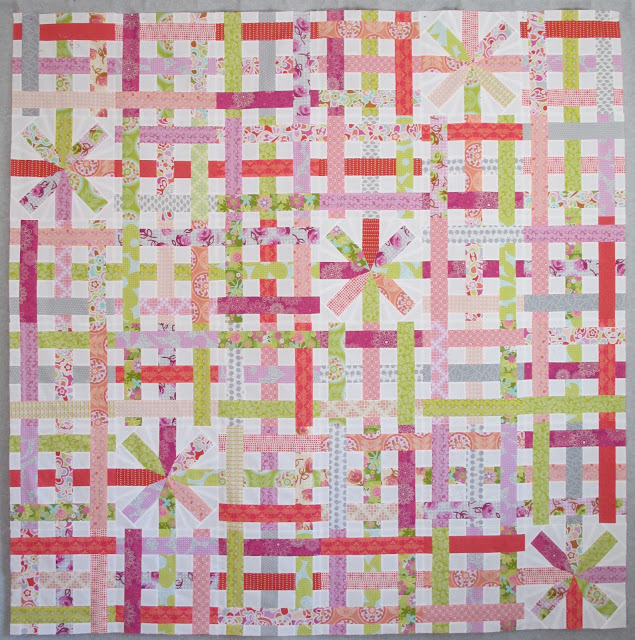 The bows really set the whole quilt off in my opinion, Thelma. Great job. Such a charming quilt. I have a couple of charm packs of colorful polka dots and am wondering how those would look in this pattern in a small quilt for the Linus Project. I really like the Ribbons 'n Bows pattern you've developed. Thanks for sharing, Thelma. Your creativity is inspiring. Very cheerful! And so many seams! Your modification of blending two patterns really paid off. Love it!